At the captain's insistence, Obi-Wan takes charge of the ship's defense, and manages to destroy most of the pirate ships. 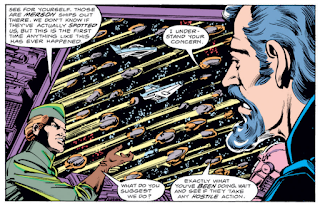 However, RKO detects a signal coming from the lounge which he believes the pirates could be using to track the ship despite its silent running measures. Word quickly passes amongst the passengers, and when Obi-Wan arrives in the lounge, he finds a mob accusing Tryll of working with the pirates. When Obi-Wan insists they have no proof, the mob turns on him, instigated by one passenger who recalls Obi-Wan's earlier meeting with Tryll. But with the assistance of the Force, Obi-Wan realizes a fermentation device in the lounge is emitting the errant signal, and destroys it, ending the threat. 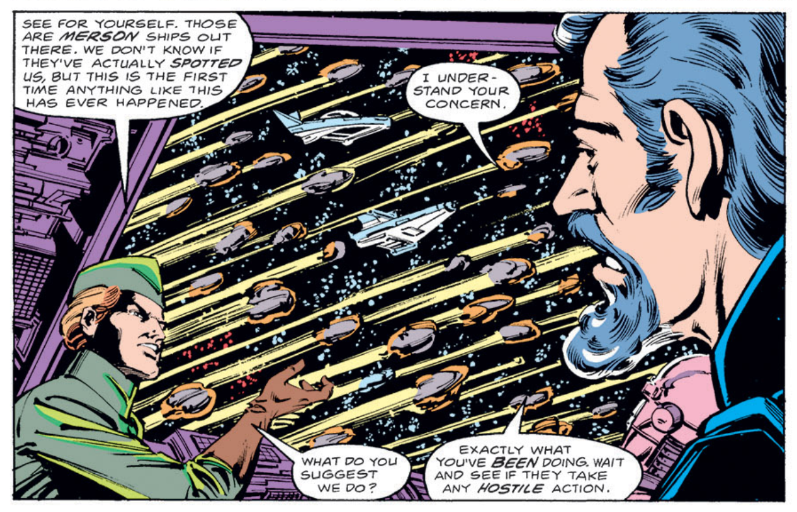 In the present, everyone applauds Leia for her storytelling skills, and with the repairs complete, the Falcon returns to hyperspace. 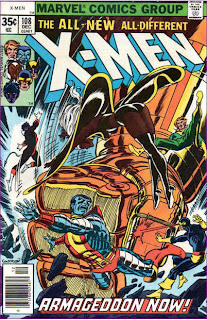 Though still drawn by regular artist Carmine Infantino, this issue is written by Mary Jo Duffy, a fan-turned-editor/freelance writer at Marvel for much of the 70s and 80s. She will eventually become the regular writer of this series with issue #70, and remain as such until the book is cancelled with issue #107. 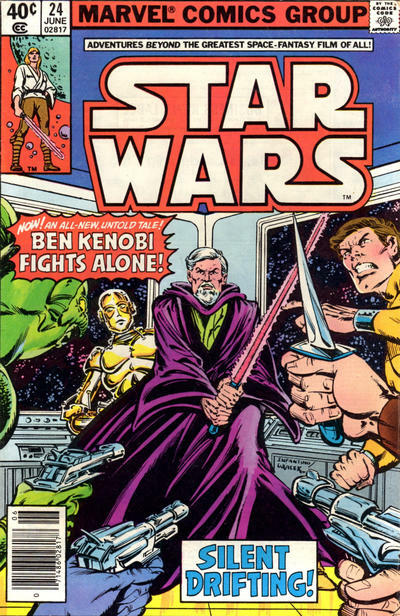 This is the first issue to feature Obi-Wan in a starring role, and the first to be set in the past of the Old Republic, before the events of A New Hope. The villains of this story are the Merson Pirates, so-called for their tendency to patrol the Merson asteroid belt for victims. This is their first and, per Wookiepedia, a brief mention in an online Holonet News article pre-Episode II aside, only appearance thus far. None of the other characters introduced in this story have yet to appear anywhere else, either. 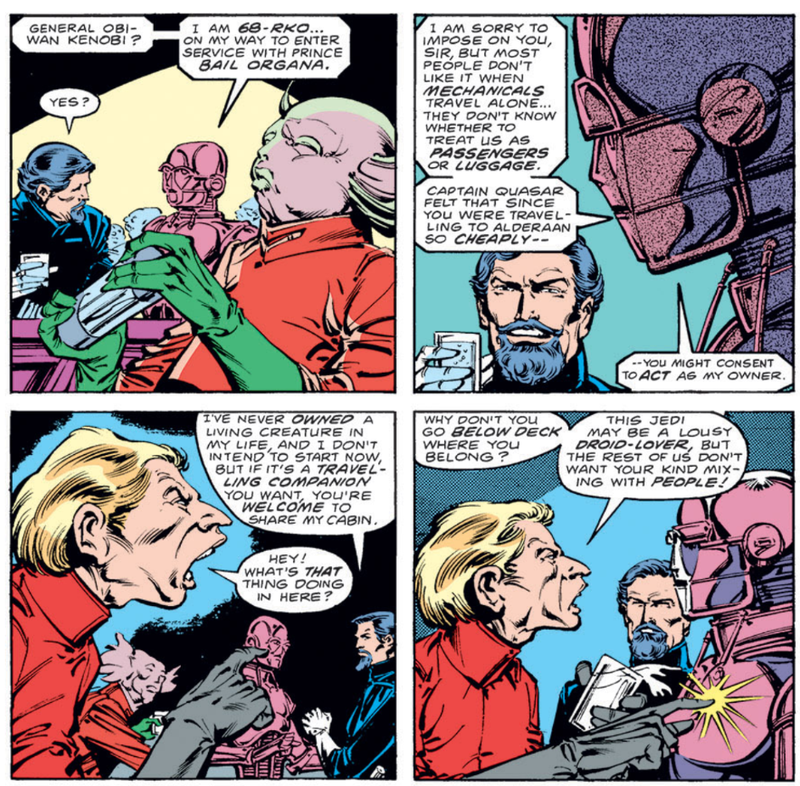 This is the first issue to be published crediting Jim Shooter as the Editor-in-Chief (he was previously credited as a consulting editor on the series). A divisive figure within the comics' industry, Shooter would eventually alienate many creators during his time as Marvel's E-i-C, but his tenure in the big chair is also well-regarded by many fans for the consistent level of professionalism and quality he brought to the company, a tenure that would end the same year as this series. 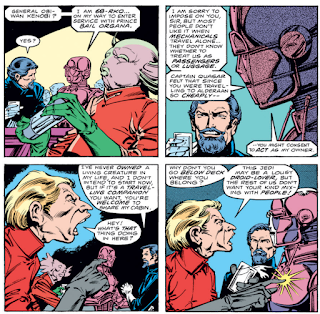 The anti-droid sentiment on display in previous issues of this series continues here, and plays a role in Obi-Wan's friendship with RKO. Han insists that Leia embellished the parts of her story involving the Force, calling it "hocus pocus". Obi-Wan is referred to as "general" in this story, even though there's no indication that the Clone Wars are occurring at this time. Also, Obi-Wan wears a fairly generic blue uniform with white gloves, boots and a belt, rather than what we now know to be his Jedi robes (except on the cover), and is traveling sans apprentice. He is, of course, also much closer in appearance to a younger Alec Guinness than Ewan MacGregor, and he wears a goatee rather than a full beard. 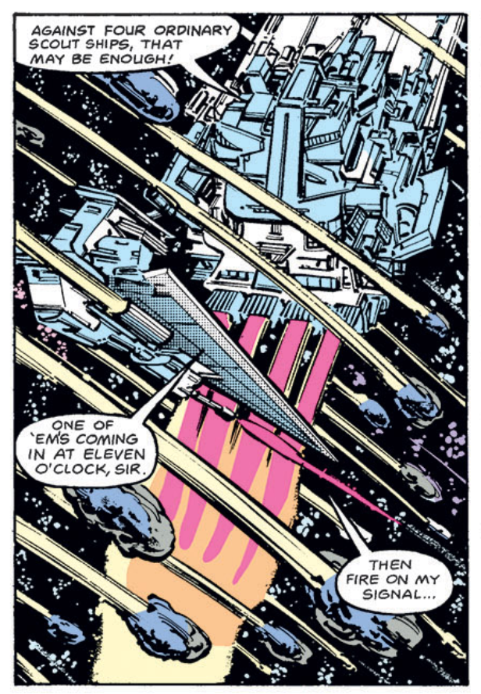 Obi-Wan tells the ship's gunners to fire at the pirates at "eleven o'clock". 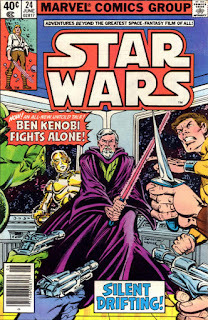 Flashback tales starring Obi-Wan Kenobi pre-A New Hope are such an obvious idea it's a wonder it look Marvel this long to do one (though LucasFilm may have put the kibosh on it earlier in this series' run), and it's no wonder that the Expanded Universe, in all its various forms, returns to that idea again and again (Marvel's current series has already done one such tale, and has announced another). Reading something like this nowadays, there's a lot of fun to be had in seeing what the creators came up with for a character and era that has since become so fully fleshed out and detailed, but which was, at the time, more or less a blank slate. Impressively, not a ton of what's presented here has been directly contradicted by later stories - the general idea of a Jedi just passing through but being called into action when a crisis presents itself seems like something that could have easily happened in the more fleshed-out Prequel Era of today. Some of the details are off, like Obi-Wan already being addressed as a general (I'm also particularly amused by the idea that, at the time, it was apparently assumed that Obi-Wan's robes were a Tatooine thing, not a Jedi thing, leaving him to wear a more basic, comic book-y outfit in this story), but there's little in the overall thrust of the story that is too far off base from what we later learn of the Old Republic Jedi. And the story is a fairly entertaining done-in-one as well, structured as both a classic suspense story (with the ship trying to evade detection) and a whodunit, the resolution of which being fairly clever, in that the signal being sent to the pirates wasn't being actively transmitted by anyone. That the series' first big Obi-Wan solo adventure doesn't really involve much in the way of big flashy, action scenes also fits the craftier, cagier characterization of Obi-Wan already on display in A New Hope. So far, the standalone issues of this series have been surprisingly solid (and in the case of #16's introduction of Valance the Hunter, very good), and this one continues that trend. It's enjoyable as a historical curiosity, a look at what creators were imagining for the days of the Old Republic when so few details of that time existed, but it's also entertaining as a story in its own right. 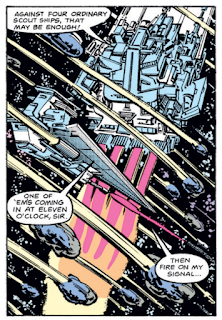 The Siege of Yavin begins! Not a bad "non-fill-in" "fill-in" issue, and with the actual creative team.